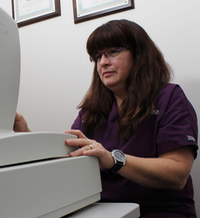 Brenda has been with Rosen Optometry for almost 20 years and is an experienced optometric technician. She is an expert on contact lens insertion and removal and is skilled in specialized testing. Brenda keeps the office well stocked to insure we have all the supplies we need to take care of our patients. In her spare time, Brenda likes to take walks and explore new restaurants.